Today in America TV announces April air dates for the city of Prince George, British Columbia. The award winning cable television program welcomes the northern neighbor to its media market. Covering the United States and Canada with high quality television. Today in America TV is pleased to announce April air dates for Prince George, British Columbia. 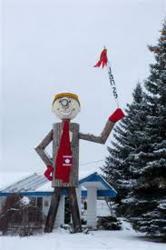 The northern Canadian city is known for its top quality drinking water, its city mascot, a 27 foot structure named Mr. PG and for the renowned Street Spirits Theater Company. Residents and visitors to the area can watch the innovative cable television program on CKPG-News. Prince George is the biggest city in northern British Columbia. It is located on the traditional territory of the Lheidli T'enneh with a population of approximately 76,000 people. The city provides many opportunities for families and singles in employment, housing and a diverse variety of interests for people of all ages. Visitors can enjoy hiking, fishing and camping in the natural beauty of the area. The Arts are very active with many top notch live performance venues. Teens can get involved in the Street Spirits Theatre, a troupe of socially conscious youths who create and perform improvised plays that affect kids their age. Today in America Terry Bradshaw is pleased to offer air dates for this area. Show host Terry Bradshaw is a sports celebrity and former professional football player. He played for the Pittsburgh Steelers for 14 years before he retired from the game. His new career in television started soon after that and he has been working in the industry for over 20 years. He can be seen on Fox NFL Sunday as an analyst. Nutrisystem, the popular weight loss program has also selected him as the spokesperson. 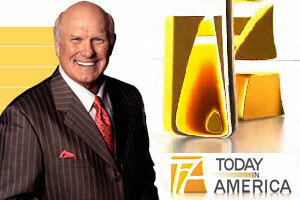 Today in America with Terry Bradshaw is an original cable program directed toward active professionals. The show’s topics cover a variety of interests pertinent every day living. The producers travel throughout the United States and Canada to film the most compelling stories. The engaging program is carried on regional and national cable networks and is formatted to be convenient to watch. More information can be found at todayinamericatv.com.